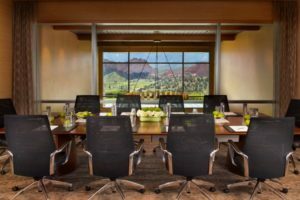 Executive and board retreats are growing in popularity, and options regarding how and where they are held are evolving. These working “getaways” are used to conduct strategic planning sessions focused on the next step or future of an organization. Although these are typically smaller meetings, the stakes are big and can be even more laser-focused with more senior leaders in attendance. So how do you bring a Colorado experience together for a smaller group of astute attendees? Define the objective of the retreat with your executives. Is this an annual event or was there a recent merger/acquisition that require team coming together and blending cultures and ideas? In either situation, the core of these smaller, higher-end experiences is to build trust and camaraderie among peers and colleagues, but what are they hoping to accomplish by the time they return? Map out discussion topics to determine needs for meeting space. Are there sessions that will drive interaction amongst the team or board and will there be people from outside the organization to provide various views on business trends and challenges? What about team-building? Even high-level executives and board members need a little help remembering they are part of a team whose priority is to help make the organization successful. Mapping out the format will help steer you down the road for your venue and location. Garden of the Gods Collection in Colorado Springs offers attractive board rooms, great views, and upscale lodging and activities all in one place. Courtesy Garden of the Gods Collection. There are many higher-end venues in Colorado that cater to retreats and partner with planners to create a memorable and productive experience for participants. Choose from all sorts of indoor and outdoor gathering places from guest ranches, inns and fishing camps to boutique hotels and luxury safari-style tents for clamping. An aerial view of the river, stunning canyons and Gateway Canyons Resort & Spa, created by the founder of the Discovery Channel in Gateway, Colorado. Courtesy Gateway Canyons. Where do you start? Start by using Destination Colorado’s online RFP form. Submitting information puts you in touch with 120 members that work together and help make organizing and hosting a gathering in Colorado easy. From meeting planners who can help with parts of the event or all of it to host properties that provide flexibility and offer maximum impact, it’s all at your fingertips. Saves you time, headaches and frustration! Consider what season makes sense. Of course, the time of the year will be a factor regarding where to go, but Colorado has so many great venues and activities that can be utilized throughout the year. 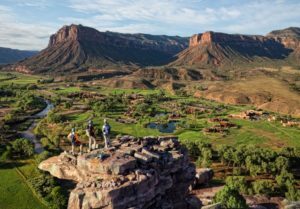 From golfing and whitewater rafting in the summer, hitting the slopes in the winter, zipping across a challenging ropes course in the fall, and climbing into a Jeep for some off-road adventure or a helicopter to get a bird’s eye view over some of the most beautiful canyons in the spring. There’s so much to do no matter the time of year, and like any destination have an alternative plan and appropriate clothing in case weather sets in. 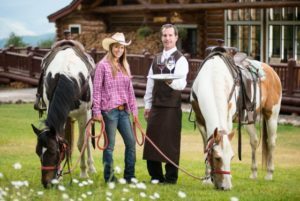 A one-hour horseback ride with Beaver Creek Stables delivers guests to a memorable dinner at Beano’s Cabin on Beaver Creek Mountain. Photo courtesy Sean Boggs/Vail Resorts. Focus on the meeting and leave the details to an expert. Now that your dates and venue options are narrowed down, a meeting and event planner can be very instrumental in pulling together the pieces for you. From offering negotiating power and coordinating with host properties to arranging all the activities the group will do together, a planner will stay on course with your group’s objectives and budget, all the while making life easier. Of course, collaborating with your team throughout the planning is extremely important and having an expert on your side before, during and after is a lifesaver! Keep in mind that the executives and board members on the retreat are there not only to collaborate, share ideas and discuss each other’s perspectives and goals, but also to get to know one another personally. Finding a nice blend of open discussions and strategic thinking at a beautiful venue mixed in with some fun, makes the experience memorable and rejuvenates executives to lead their teams with vigor when they return. Kim Schmitz is the CEO/President of Spin Event Management, a full-service corporate event management and marketing firm based in Parker, Colorado. She has planned meetings and events across the country and enjoys living in Colorado.